Daikin is a global enterprise that specializes in eco-friendly air-conditioning ventures. The company has been actively revolutionizing the lives of Singapore residents for 40 years now! It has seen the up’s and down’s this country went through, and been there for the ride all along. 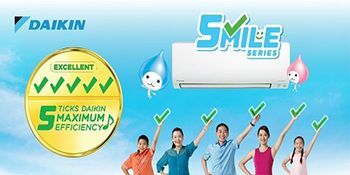 Daikin has developed a trusty relationship with Singapore and its residents, and promises to be always there to fight the humid temperature of Singapore with its high-tech, top rated and energy efficient air conditioners for life. Singapore is a country that suffers from a hot and humid climatic range, and Daikin has been a perpetual presence in the country since 1968. Their air conditioners are long lasting, energy efficient as well as technologically advanced. Fitting them in your homes will surely elevate your way of life. Furthermore, Daikin was there when the HDB was first paving the way to provide excellent housing choices for Singapore residents. So their products abide by the HDB guidelines for fitting air-conditioners and air-cleaners! 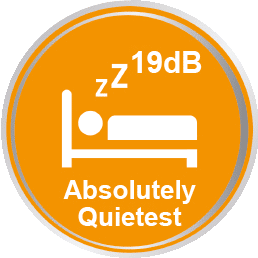 Not only has Daikin revolutionized the air conditioning technology all over the world, but they are also the absolute best in the field. Daikin was the first company to introduce the world’s first super-efficient VRV Systems for the commercial buildings in Singapore. 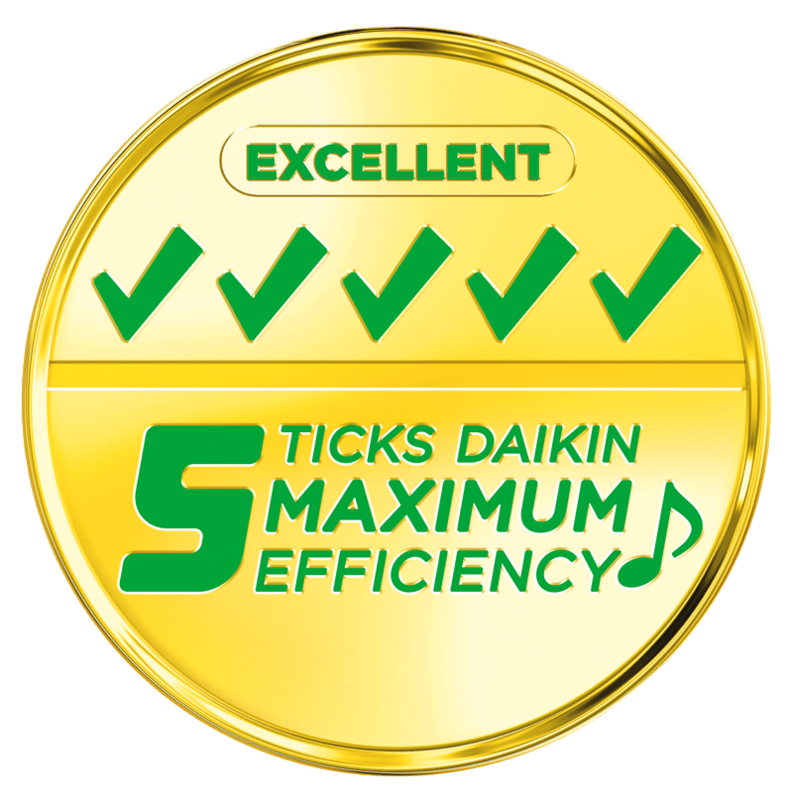 In short; Daikin is the best of the best in the air-conditioning industry! So whenever you’re ready to buy a new AC unit, always go for Daikin! 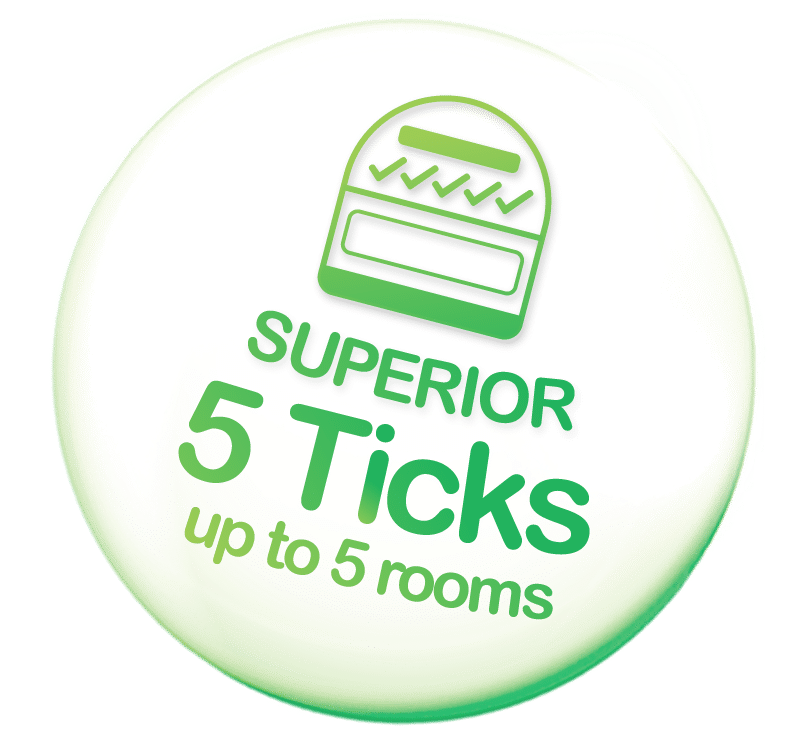 The 5 Tick Smile Series? 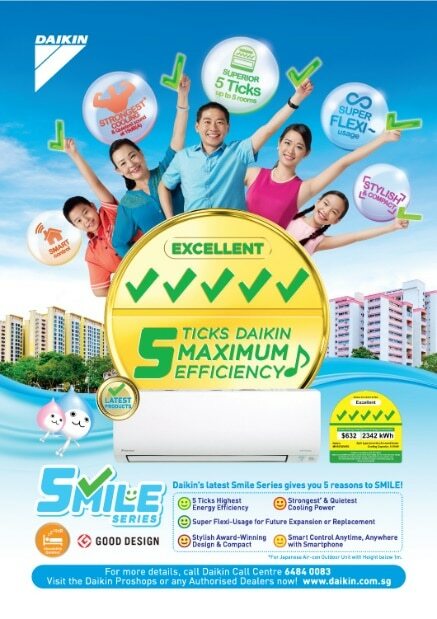 Daikin 5 Tick Smile Series is an inverter air conditioner system designed specifically to address Singapore’s quest for eco-friendly products! 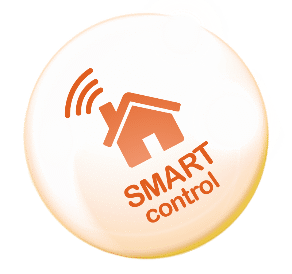 Energy efficiency is something that every person wants in their smart technology, and Daikin has risen to the challenge. 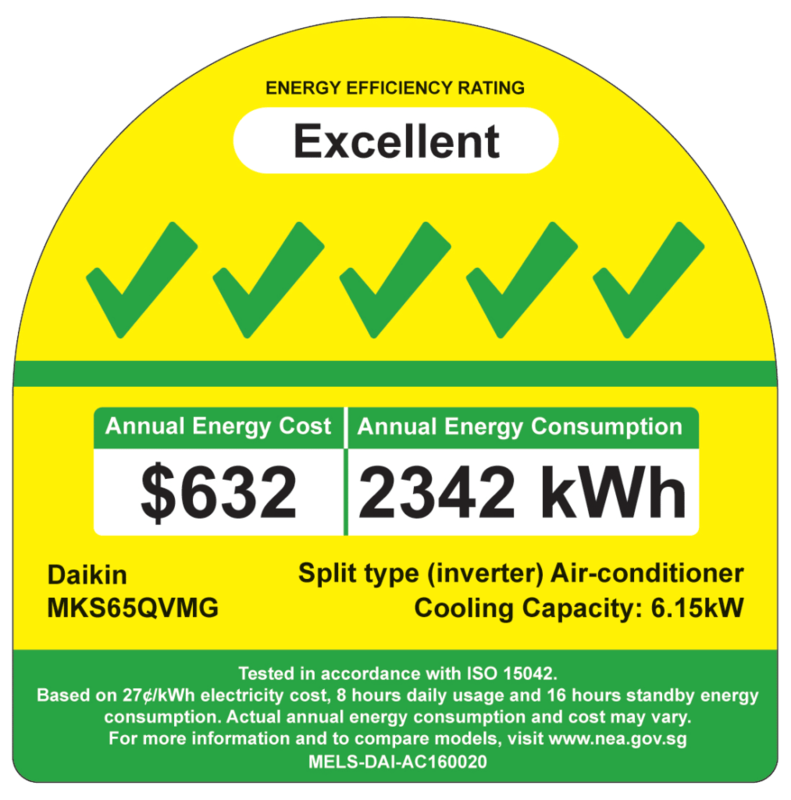 Daikin’s Split Type air conditioner not only minimizes the cost of your average electricity bills but goes the extra mile to be environmental friendly in the process as well. Tested in accordance to the ISO 5042 rules and featuring a stylish and compact physique, this air conditioner is one of the best you’ll find in all of Singapore! 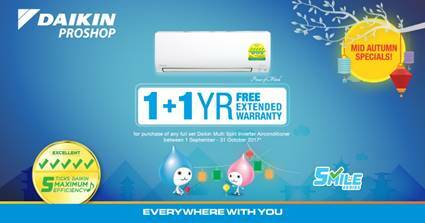 With Daikin’s Proshop Mid-Autumn Promotion Specials you can get a 1+1 Year free extended warranty* for purchase of any full set of Daikin Multi Split Inverter aircon. Valid from now till 31st October 2017. 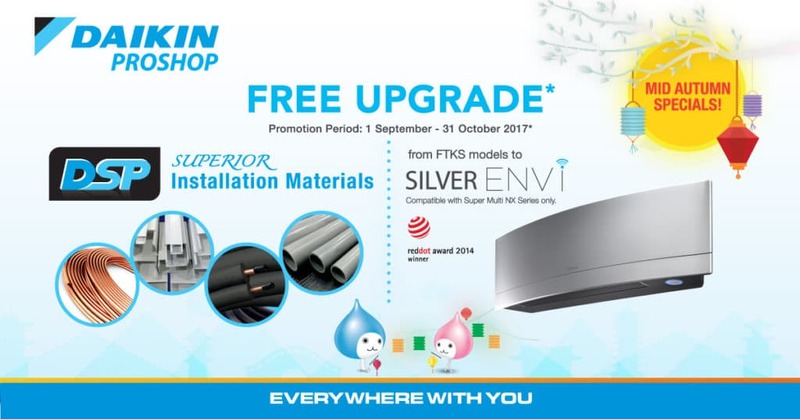 Enjoy free exclusive upgrade to Daikin Envi Series aircon systems for selected models only (limited stocks, while stocks last)! The dates are from 1st September to 31st October 2017 so get moving, for this is a definite deal of a lifetime! Do remember to also sign up for a free Daikin membership and receive a pair of Exclusive Pichonkun Electronic Lantern, while stocks last. *T&Cs apply. Inclusive of the 3-months additional warranty for Daikin Proshops.